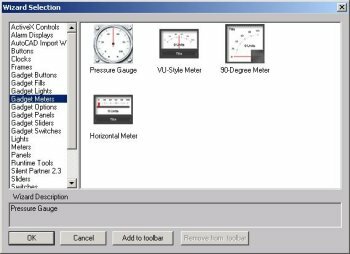 Gadget Button Meters include the following objects, samples of which are shown in the selection box at the right The selection box shown is how the wizards are selected from within Wonderware® InTouch. When placed on a window in WindowMaker, double clicking on a Gadget Light Wizard will display the setup page shown at the right. Double clicking in the Expression field brings up the standard InTouch tag dictionary selection page. Typing in a new InTouch tag name and pressing Enter brings up the InTouch Tag Definition screen like any other InTouch wizard. 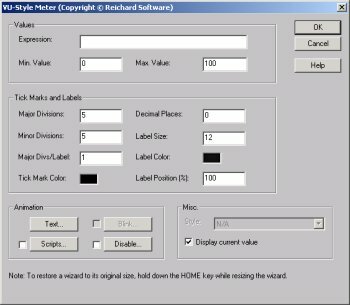 Standard InTouch Animations can be applied by clicking the buttons in the Animation area of the Wizard setup page shown here.